The Duke and Duchess of Cambridge visited Brisbane and RAAF Base Amberley during their Australian tour. The Duchess was in an L.K. Bennett dress with a clutch from Australian brand Oroton. I take back what I said about the banana - this is my favorite one so far. 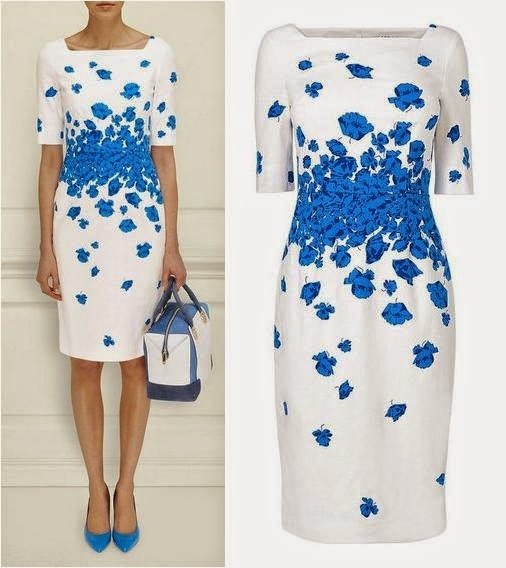 It's not only lovely (why yes, I do love her in a simple shift with a strong color to it), it's exceptionally well chosen: they visited an Air Force base, so blue was appropriate, and it has a poppy print, poppies being a special symbol of remembrance. Loving it from top to bottom. Other things that have been going on too, though the above was my fave. I was surprised that, despite the elegance at hand, her dove gray Easter service outfit didn't catch my eye. (Was I the only one getting Mathilde flashbacks?) Here's an article and gallery from Hello for that. Also: GEORGE. That's all. Video: George and his entourage visit the zoo.